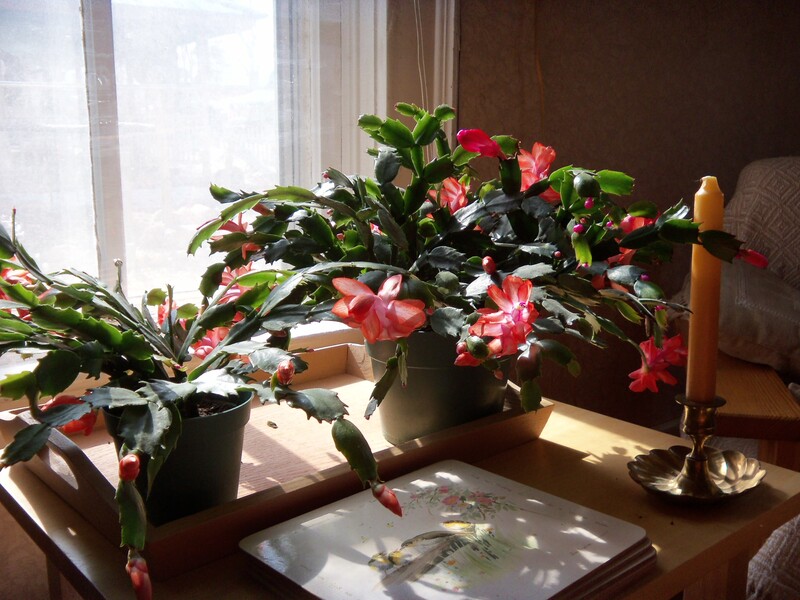 I recently received an email from a friend who was delighted that the Christmas cactus I had given her years ago was blooming. Mine is blooming too. Looking out the window at all the snow, I marvel that only old wavy window glass stands between the freezing weather outside and the flame-colored blooms inside. Any cactus that blooms, despite little rain and poor soil, seems to be a miracle, but a cactus that blooms between Halloween and then hangs on through Thanksgiving and Christmas, what a treat! It seems to be a metaphor: no matter how barren the land or mankind, the potential exists: anyone anywhere can bloom. I’m reminded of Florence Blakemore, a dear, Canon City friend who is now deceased. Her husband Joe died in the fall. Busy with obligations following his death, she neglected to plant the spring bulbs that she had bought. The bulbs sat on the kitchen counter. Months passed. Finally, finding her feet beneath her, Florence scooped them up and flung them into the snow-covered garden. I love this story: the cycle of the seasons, death and rebirth. Something to think about as the days grow shorter. I think of my London friends – living at the same latitude as Hudson Bay. Living in London where winter dusk creeps in at 3:30 p.m., I would often imagine our forefathers living their lives by candlelight. Artificial light has dulled our senses. Only farmers are in tune with the Earth’s sow and reap cycle. Reflect on your own notions of death. What are your notions on re-birth? If you are a gardener, consider the gardening cycle. Write a short piece in which a parent explains “death” to a young child. A little laughter is a good thing. I got them laughing at my father’s funeral – had him fishing in the sun – glad that he wasn’t really dead and sitting inside on a lovely day. The fish weren’t biting but he didn’t really care. He was checking out the landscape… eating a peanut butter and jelly sandwich… drinking a beer. Living the good life. Cerainly not dead.